FDG Entertainment may not be a name many Nintendo fans are familiar with, but we think that'll all change with the Nintendo Switch. The publisher has confirmed its support for the system, confirming two games for the first half of 2017. We now know one for certain, and are pretty sure of the second. Monster Boy has been confirmed for Nintendo's next-gen system; it's effectively a new Wonder Boy game, with original series creator Ryuichi Nishizawa involved in the project. FDG listed the Switch in a tweet promoting this rather neat blog update on the game. If you need a reminder of how this is shaping up, check out the Gamescom trailer below. As you may also recall, FDG Entertainment recently confirmed that the updated console version of Oceanhorn would come to a Nintendo system. As the company has confirmed that two games are in the works for Switch, we'd be very surprised if this wasn't also on the way. It's pleasing to see more support for Nintendo Switch from publisher and developers of varying sizes. Are you looking forward to Monster Boy and - as is very likely - the Wind Waker-inspired Oceanhorn? More games is good news. Very interested in Oceanhorn too. Cool, first reason to get a Switch. I'm glad to hear the support so far coming to the Switch. According to an earlier Tweet by the developers, they said the "Nintendo Switch is awesome! Can't wait to support it with our games!" Very hopeful. Great call! I'll get it on the Switch, then. I'm interested in oceanhorn cause I love the wind waker! But I do feel slightly dirty about giving such a blatant rip off any money. "Can't wait to buy 3rd party titles!" --every person who wants to buy Switch, hopefully. Let there be a positive feedback loop of people buying games and developers making them, and not the negative feedback loop that Wii U had. Great news.Hoping we'll see the other Wonderboy game on Switch too. Brilliant, been looking forward to this. Both of their games looks great! This game looks great. I'll definitely get it on Switch. So, basically, we now have an official remake of a Wonder Boy title for the Wii U, and a spiritual successor of the Wonder Boy series for the Switch? Not interested in those, but i'm glad Switch is getting more support! Hopefully the Switch actually gets a good launch compared to 3DS and especially Wii U. We need more news like this! This game looks amazeballz. 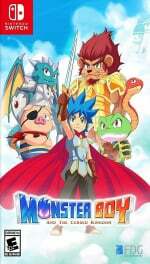 Monster Boy is Wonder boy incarnate. Generally speaking if Switch gets EA Sports games on the console as decent ports and not dillydally version like FIFA13 on Wii U it'll be great. That will make people buy it. Sports games sell. They sell massively. Monster Boy! It may only be Monday but this has made my week. Now the other lot need to announce the Wonderboy III remake is coming to Switch too and I will be a really happy camper. It's good to see support early on. But these games look like they would be at home on a GameCube. Oceanhorn<windwaker hd. I'd like to see what games are being released that would be beyond the wiiu's capability to run. Definitely on board with this one! Looks like some good and fast paced fun. It is pretty exciting to see all of this support coming out for the Switch early on. "It's pleasing to see more support for Nintendo Switch from publisher and developers of varying sizes." Would be nice if one of those publishers and developers was Nintneod. So far they showed us a new system, hardware they plan on selling for probably over $200, but the only game they have confirmed on it is Zelda BotW. That's it, 1 confirmed game. And yes, I know a 3D Mario game was in the trailer but they did the opposite of confirm that. Same for Pikmin 4 which they haven't mentioned at all in over a year now. Well unless it is that 3DS game. Who knows. Nintneod has more games on Apple products this holiday - Super Mario Run on iOS - than they do on Wii U, which has zero. Nada. Zilch. Looks good, my main complaint is the art style. Looks like it was made on unity and they always use that same 2.5d style of game. They all have the same prepackaged physics engine and art style and I just wish we could get some more uniqueness to the art styles. @rjejr Knowing what games are coming five months in the future won't change by a single day when you'll be able to play them; a few months will be plenty of lead time. Besides, advertising something before the holidays that won't be available until after the holidays is a complete waste. Waiting until people pay off their credit cards and (in the U. S. at least) start getting their tax refunds makes more sense. Looks very nice neat n fun!! I like. Nintendo Switch get! @PanurgeJr "Knowing what games are coming five months in the future won't change by a single day when you'll be able to play them"
Not showing games 5 months in advance means people don't wait until Switch releases in March and they buy a PS4 or X1S this holiday, meaning they don't have enough money left to buy a Switch in March, b/c they'll be using their tax returns to pay off their new console and buy games for it, so instead of playing games Day 1 on Switch they wont' be playing them for another 9 months when they buy a Switch for Christmas. So it's not a single day delay, it's about 300 days. Just b/c Switch won't be on sale this Christmas doens't mean people won't buy a console this Christmas. If Nintendo wants people to save their money for Switch in March, then they better tell people what games will be available in March, other wise people will be buying another console now, and Switch a year from now. Also, people who already own a PS4 or X1S may be looking at a new 4k TV, which will be very popular this holiday, or Sony's PSVR, or the Vive or Oculus. So if Nintendo wants people to have enough money put aside for Switch in March they better starting talking. But since they already said they won't talk until 2017, well Swtich is going to be off to a slow start, just like 3DS. Early adopter Nintnedo fans, then nothing until the holdiays. @rjejr Nintendo isn't competing for your 2016 dollars, or euros, or yen, or whatever is in your wallet. They'll be competing for your 2017 dollars. They'll start in March, and they'll continue throughout the year, and they'll focus on holiday 2017. Switch has to have a strong first year, not a strong first month, or week, or day. People waiting until next Christmas to get one because they wanted a shiny new 4K TV this Christmas will be just fine with them. People like us who read and comment on long threads on video game websites do not represent the mass market. And the mass market isn't going to hold off on holiday purchases because Nintendo announced the launch lineup for Switch. @PanurgeJr "And the mass market isn't going to hold off on holiday purchases because Nintendo announced the launch lineup for Switch." Maybe not, but they certainly aren't going to hold off on holiday purchases if they don't announce the launch line-up either. There is more of a chance for people to buy a NES Mini and a blu ray player this holiday instead of a PS4 or X1S if they know they want a Switch in March. They have nothing to loose by taking about it earlier, Wii U is dead anyway, 3DS is aging, but everything to lose if they wait, simple as that. I just bought Oceanhorn, which is a shame as I'd have loved to have supported it on a Nintendo platform. Hope they bring the sequel to the switch as I'd be all over that.